A small and intimate view of the falls from the Canadian border, Horseshoe Falls and Table Rock, c. December 1856-January 1857, emphasizes an infinite vertical drop and focuses on the geological formations rather than an expansive landscape. Frederic Church’s focused study resembles the right-most portion of the three-sheet panorama of the Horseshoe Falls as well as Niagara Falls from the Canadian side. 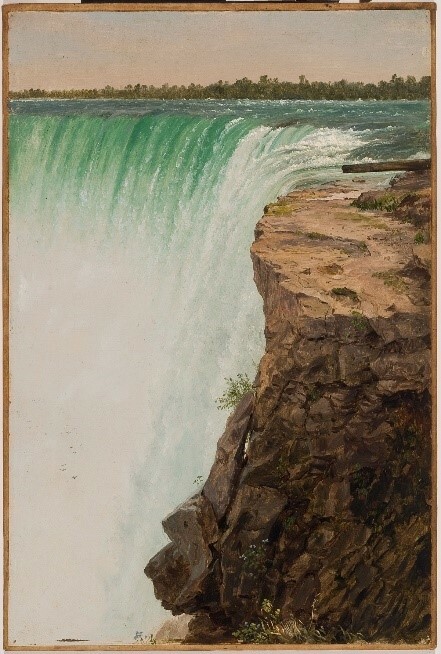 A keen observer of the natural world and avid student of the geological sciences, Church traveled to Niagara Falls on four separate occasions to examine the area’s greatness and would later complete one of his most famous paintings, Niagara (National Gallery of Art, Washington, DC, 1857). Horseshoe Falls and Table Rock was painted during a most critical decade to Church’s lifetime, one in which he sold three of his most famous paintings: Niagara (1857); The Heart of the Andes (The Metropolitan Museum of Art, New York, 1859); and Twilight in the Wilderness (Cleveland Museum of Art, 1860). This decade also included several of Church’s crucial sketching trips, aside from his four trips to Niagara Falls, Church ventured to Mount Katahdin, Ecuador, Newfoundland and Labrador. The final key aspect of this decade came in 1860 with Church’s purchase of the “Farm” and his marriage to Isabel Mortimer Carnes shortly thereafter. Geography was an exciting and expanding field during Church’s lifetime; and a subject in which he was intensely focused. Such is the concentration of the recently opened exhibition Past Time: Geology in European and American Art at The Frances Lehman Loeb Art Center at Vassar College, which includes Horseshoe Falls and Table Rock in addition to many other examples of Church’s exploratory precision. Past Time looks deeply at sketches and studies made from the 1770s to the 1890s, as artists traveled and investigated the land internationally, noting Earth’s craggy features. Church, motivated by his reading of scientists and geologists, took very seriously the informative and educational aspect of his artwork. Often, his “Great Paintings” were accompanied by descriptive pamphlets meant to heighten his viewers’ understanding and appreciation of their factual content. The exhibition continues through December 9th. 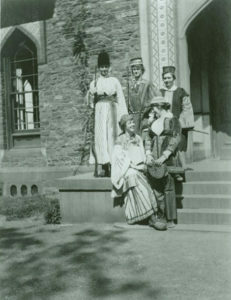 Louis and Sally Church’s guests are pictured above, dressed up in traditional garb from Olana’s historic collection. Frederic Church, father of Louis, had an extensive Middle Eastern clothing collection which remains largely intact, including garments, armament and weaponry. Frederic Church’s trip to the Middle East in 1869 greatly inspired the creation of his home at Olana and influenced his architectural design. All aspects of Middle Eastern culture were interesting to Church— including the attire. The collection of traditional clothing acquired during his travels held multiple uses. These garments were put on display alongside other decorative objects, included in Church’s paintings, and donned by guests (as pictured above). Come see them on display during this year’s exhibition “Costume and Custom: Middle Eastern Threads at Olana”, opening June 17. This depiction of the imposing volcano Cotopaxi in Ecuador is part of the exhibition OVERLOOK: Teresita Fernández Confronts Frederic Church at Olana, open through November 5. The exhibition is collaboration between The Olana Partnership and the Colección Patricia Phelps de Cisneros. Church’s Cotopaxi is one of over fifty works coming to Olana on loan from the de Cisneros collection, which will comprise a site-specific installation piece created by contemporary artist Teresita Fernández. Art historian Andrianna Campbell, writing for the de Cisneros collection catalogue, identifies Church’s guide on this excursion as the young painter Rafael Salas, and suggests he is the red cloaked figure we see in the foreground of the work. The Salas family was an important artistic presence in the region. Rafael’s brother, Ramón was an accomplished watercolorist and their father Antonio painted historical and religious scenes. Church remarked on Antonio’s prominence, citing him in his travel dairy as the most “distinguished” painter in Quito. 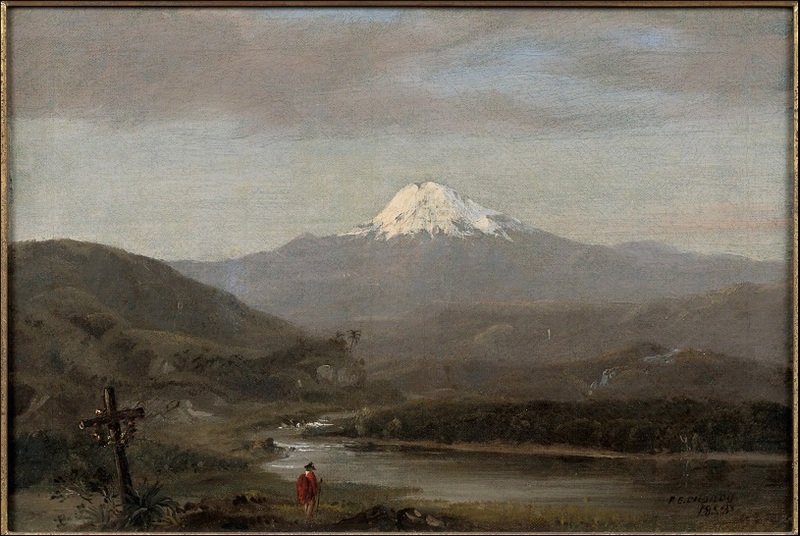 In 1857 Frederic Church would return to the Quito region again, his heart set on reaching the highest peak, Chimborazo. He chose for lodging the same Hacienda that Alexander von Humboldt had stayed in decades earlier. There he saw an impressive portrait of a young Humboldt by José Cortes Alcocer, painted while the scientist was in residence during the summer of 1802. Church engaged none other than Rafael Salas to create a copy of the work, which he could bring back with him to New York. Eventually the work (now in private collection) hung in the Sitting room at Olana. Cotopaxi was a subject that Church returned to again and again, culminating in the great masterpiece of 1862 now at the Detroit Institute of Art, which depicts the volcano in full eruption. Yet, the work in the de Cisneros collection is likely Church’s first painting of the mountain and its connection with Rafael Salas makes it an exciting work to have on loan to Olana for all our visitors to enjoy. This work by Danish-born artist Fritz Melbye is one of fourteen works currently on loan from Olana to the exhibition Pissarro: A Meeting on St. Thomas on view through July 2, 2017 at Ordrupgaard Museum in Denmark. The exhibition tells the story of the great Impressionist painter Camille Pissarro’s early years, and of how the Danish Golden Age painter Fritz Melbye (1826-1869) came to play a crucial role in Pissarro’s life and art. Fritz Melbye was friend of Frederic Church and the two traveled together to Jamaica in May 1865. Melbye was born in Elsinore, Denmark and trained as a painter under his older brother, Anton Melbye. He initially painted seascapes in the family tradition his brother had taught him, but he increasingly turned to landscapes, coastal and town views. He preferred a realistic style, often with romantic scenes. He was a frequent exhibitor at Charlottenborg in Copenhagen between 1849 and 1858. In 1849 he set off for the Danish West Indies, and around 1850 Melbye arrived in St. Thomas. There he encountered a young Pissarro who was growing up on St. Thomas as a Danish citizen, and who he encouraged to take up painting. 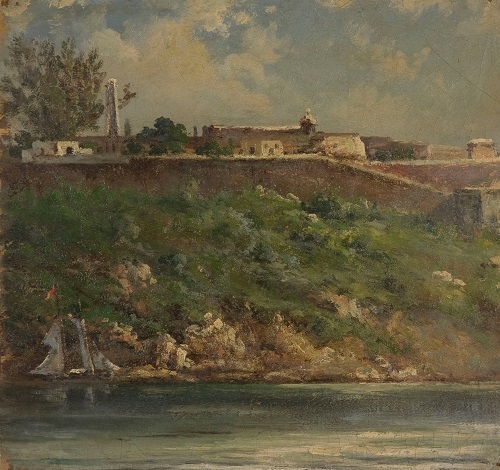 The two artists became friends and Melbye served as a mentor to Pissarro as the two artists traveled and painted together throughout the Danish West Indies and later in Caracas, Venezuela. After several years, the two parted company and Pissarro set off for Europe. Melbye stayed until 1856 and then briefly returned to Europe, living some time in Paris, before traveling to North America where he set up a studio in New York City, and presumably met Frederic Church. After their sojourn together in Jamaica, Melbye set off on a journey in 1866 to the Far East in search of new adventures, leaving his studio in Church’s care. In Asia he used Peking as a base for travels around the region, where he was commissioned to paint the Imperial Summer Palace. His travels also extended to Japan. He died in Shanghai 1869. Among the studio contents entrusted to Church were a series of sketches by Melbye and Pissarro, executed in those early years on St. Thomas. For decades Church kept the works safe in his own studio, and then later moved them up to Olana. They continued to remain intact throughout the tenure of Louis and Sally Church, and even as Olana, itself was preserved in 1966 as a museum. The result is that Olana owns a significant collection of works by both Pissarro and Melbye, a selection of which have been loaned for this exhibition. Paintings by both Melbye and Pissarro will also be featured in the upcoming exhibition Overlook: Teresita Fernández Confronts Frederic Church at Olana, opening in the Sharp Family Gallery, May 14, 2017. For more information on the exhibition in Denmark click here.